Nowadays, more and more applications need all-in-one solution to make the system looks compact and saving space. In traditional way, most manufactures combine panel and MB or other main board to form an All-In-One solution. 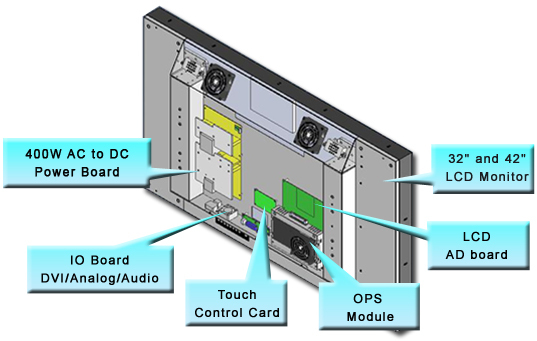 OPS solution digital signage intends to separate panel and system, makes them as independent modules to increase scalability and reliability. Intel’s OPS (Open Pluggable Specification) offer a universal, embedded interface which can link external media players with a large video display, thus providing users with integration of their signage and conferencing applications. With Winmate OPS Solution Digital Signage, it simplifies interoperability and application upgrades designed to meet the digital signage requirements of individual customers, while helping to future-proof technology investments. 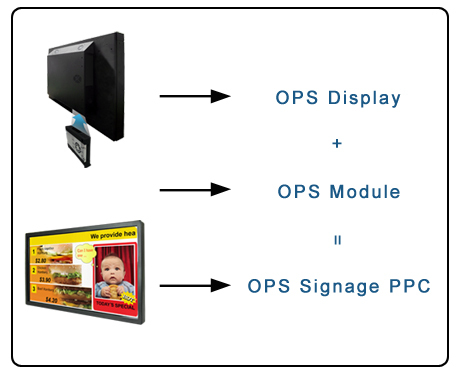 Winmate has announced 3 different series of OPS Digital Signage in 4 different sizes. Customer can choose any of the OPS display from 4 different sizes (21.5”, 24”, 32”, and 42”) and insert any one of OPS module (OMIC, OMIS, OMID) to turn into a digital signage. Customer can swap in entry-level, mainstream or high-end modules for the pluggable to satisfy their different needs. Model Name 21.5" 24" 32" 42"
Customers can further order MSO-Pro software that can enhance performance of digital signage by supporting various files such as active HTML and power point applications.